A debt burden to develop East Africa - But who really gains? If there were any fears that East Africa's economic mandarins – still stinging from a year of financial tumult – would return to a regime of fiscal caution to curb inflation and limit the effects of last year's spikes in food and oil prices, they were decisively dispelled when the East African Community's (EAC) five finance ministers delivered their budgets in June. Reading his maiden budget in Kenya, Robinson Githae announced an increase in government spending of almost 25%. In Uganda, which experienced its slowest growth rate in 25 years, Maria Kiwanuka planned to raise spending by 12%. In Tanzania, newly appointed finance minister William Mgimwa said that the government would seek $1bn from the domestic markets, increasing government borrowing by a third on last year. The return to higher debt levels in the EAC is one of the dividends of a decade of sustained growth. The region's collective gross domestic product has grown from $32bn in 2000 to $79bn in 2010. The narrative of austerity and donor conditionality is fast being replaced by the ambitions of a revived developmentalist state. 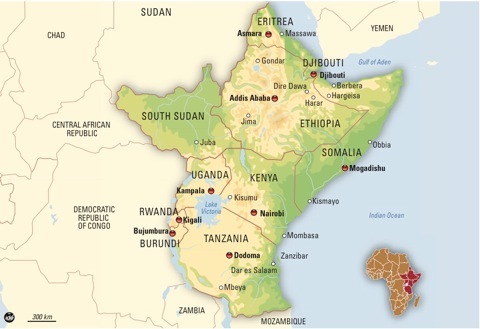 East Africa's economic planners are exploring new financial instruments as they seek long-term financing for a growing list of projects. Slow to mature and with far more manageable interest payments, infrastructure bonds, syndicated loans and one-on-one negotiations with Brazil, India and China are increasingly seen as easier than negotiations with the World Bank. The optimism of policy-makers is being fuelled, in part, by the anticipation of a resource bonanza. Uganda will soon begin production from its oilfields in the north west; Kenya just discovered substantial reserves in Turkana and is talking to Chinese investors about the coal reserves in the east; and the Tanzanian government is counting on revenue from huge gas reserves in Songa Songa. Debt accrued today, it appears, will be paid for with petrodollars tomorrow. If there are any alarm bells sounding, it should be for the fact that the hosannas of prosperity are being sung by an elite that is now reaping the proceeds of the era of privatisation.